Shuttle captain: Command station, this is ST321, code clearance blue. We're starting our approach; deactivate the security shield. Q: What are the differences among the several versions of this movie? Q: Why does Yoda state that Luke does not require more training? 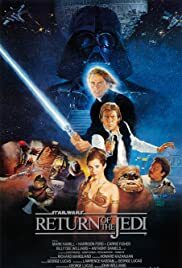 Did Yoda not object to Luke leaving in the previous movie? Q: Is Leia a Jedi Knight in this film? I'm sick of people whining about Ewoks! True, they're not the best thing that ever happened to Star Wars, but they DID happen, so deal with it! Besides, they ARE cute, and I don't care if they're marketable. Yubb Nubb! This movie always leaves me in tears. It's perfect. The end could not be better. I'm excited for The Phantom Menace because it will suddenly throw the focus of the whole story from Luke to Anakin. I love how he is revealed at the end - it would be too unresolved any other way. So those of you who are complaining that Vader's helmet was removed, take a moment to think about it. It's very effective. Vader, the man who hid behind a mask for 20 years, is finally revealed as a sick-looking man. He is not entirely machine - he's vulnerable. I don't know how the casting director happened to pick such good actors in A New Hope. They all do so well. They are believable characters. 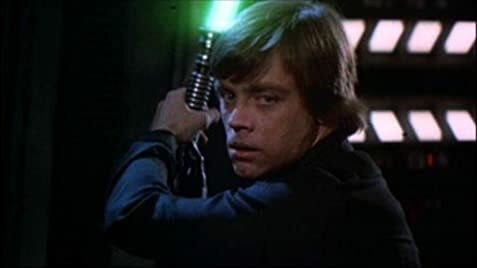 Hamill does an excellent job with his dramatic character development. Fisher does a fine job being a female role model (I mean, come on! She killed Jabba even when so many others had failed!). Harrison Ford - need I say more? The music is once again brilliant. It's so very touching and significant when you can pick out character themes at different parts of the movie. The best climax is when Luke shouts "NOOO!" and jumps out to fight his father in the Final Battle. John Williams is nothing short of a genius! What an amazing man! Already, the movie has so much more meaning for me because of Episode I. I can't wait to finally see it in the theatres (CAN I WAIT???) and then watch the original trilogy yet again. 147 of 211 people found this review helpful. Was this review helpful to you?